As the hotel is undergoing a complete makeover indoor and outdoor, it really is a wedding couples’ choice as to which room they choose to celebrate their ceremony. Presently our venue is a perfect wedding location, with people coming from far and near to privately celebrate their special day. Sheawater Hotel & Spa is a fully licensed venue and we can host Civil, Humanist or Spiritualist Ceremonies in the hotel. We have many locations both inside and out that can be used each offering their own unique individuality and can cater for ceromonies up to 450 guests. We understand that if you are choosing to celebrate your full and complete wedding with our hotel. We must set the tone as to what your guests can expect and most importantly, immediately allows everyone to settle into the anticipation of what is yet to come. This is our area of expertise and we can confidently guide you to a tailored package regardless of the size of your wedding. On the day of the ceremony guests will have already relaxed into the hotel prior to the ceremony starting. Their Cars are parked up for they day and where possible guests will have checked in, so a slight advantage here as it allows complete focus on the reception once the ceremony finishes. 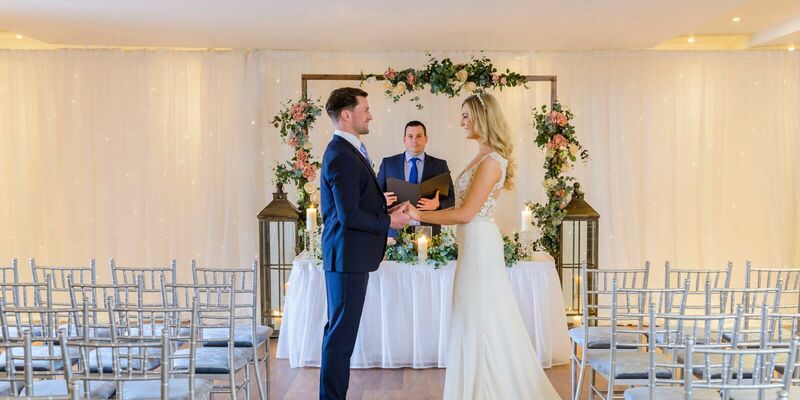 We offer a unique, stylish and contemporary ceremony packages and our exceptional wedding team will assist you in arranging all aspects of your day. We believe in providing an exceptional personal planning service, allowing you to fully focus on what matters. Our team will answer all questions so please feel to call and make an appointment prior to the showcase. Chiavari Chairs, Red Carpet, Lanterns & Candlelight options. Ceremony floral arrangment as a gift from us.